Back To School 2012: Look Out For Head Lice! It's back to school time again, which means children will re-unite with old friends and make new ones. But summer vacation stories might not be the only thing kids share when they go back to school, they could also share summer head lice. The U.S. Center for Disease Control says that in the United States, infestation with head lice is most common among pre-schoolchildren attending child care, elementary schoolchildren, and the household members of infested children. Egg/Nit: Nits are lice eggs laid by the adult female head louse at the base of the hair shaft nearest the scalp. Nits are firmly attached to the hair shaft and are oval-shaped and very small (about the size of a knot in thread) and hard to see. Nits often appear yellow or white although live nits sometimes appear to be the same color as the hair of the infested person. Nits are often confused with dandruff, scabs, or hair spray droplets. Head lice nits usually take about 8-9 days to hatch. Eggs that are likely to hatch are usually located no more than ¼ inch from the base of the hair shaft. Nits located further than ¼ inch from the base of hair shaft may very well be already hatched, non-viable nits, or empty nits or casings. This is difficult to distinguish with the naked eye. Nymph: A nymph is an immature louse that hatches from the nit. A nymph looks like an adult head louse, but is smaller. To live, a nymph must feed on blood. Nymphs mature into adults about 9-12 days after hatching from the nit. 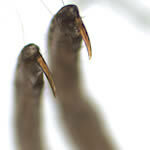 Head-to-head contact with an already infested person is the most common way to get head lice. Head-to-head contact is common during play at school, at home, and elsewhere (sports activities, playground, slumber parties, camp). or lying on a bed, couch, pillow, or carpet that has recently been in contact with an infested person. Dogs, cats, and other pets do not play a role in the spread of head lice. How is head lice infestation diagnosed? The diagnosis of a head lice infestation is best made by finding a live nymph or adult louse on the scalp or hair of a person. Because nymphs and adult lice are very small, move quickly, and avoid light, they can be difficult to find. Use of a magnifying lens and a fine-toothed comb may be helpful to find live lice. If crawling lice are not seen, finding nits firmly attached within a ¼ inch of base of the hair shafts strongly suggests, but does not confirm, that a person is infested and should be treated. Nits that are attached more than ¼ inch from the base of the hair shaft are almost always dead or already hatched. Nits are often confused with other things found in the hair such as dandruff, hair spray droplets, and dirt particles. 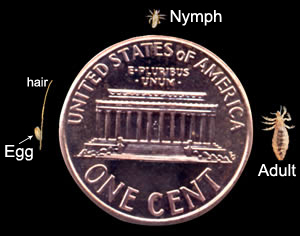 If no live nymphs or adult lice are seen, and the only nits found are more than ¼-inch from the scalp, the infestation is probably old and no longer active and does not need to be treated. If you are not sure if a person has head lice, the diagnosis should be made by their health care provider, local health department, or other person trained to identify live head lice. Is infestation with head lice reportable to health departments? Most health departments do not require reporting of head lice infestation. However, it may be beneficial for the sake of others to share information with school nurses, parents of classmates, and others about contact with head lice. Head lice should not be considered as a medical or public health hazard. Head lice are not known to spread disease. Head lice can be an annoyance because their presence may cause itching and loss of sleep. Sometimes the itching can lead to excessive scratching that can sometimes increase the chance of a secondary skin infection. Can head lice be spread by sharing sports helmets or headphones? Head lice are spread most commonly by direct contact with the hair of an infested person. Spread by contact with inanimate objects and personal belongings may occur but is very uncommon. Head lice feet are specially adapted for holding onto human hair. Head lice would have difficulty attaching firmly to smooth or slippery surfaces like plastic, metal, polished synthetic leathers, and other similar materials. Can wigs or hair pieces spread lice? Head lice and their eggs (nits) soon perish if separated from their human host. Adult head lice can live only a day or so off the human head without blood for feeding. Nymphs (young head lice) can live only for several hours without feeding on a human. Nits (head lice eggs) generally die within a week away from their human host and cannot hatch at a temperature lower than that close to the human scalp. For these reasons, the risk of transmission of head lice from a wig or other hairpiece is extremely small, particularly if the wig or hairpiece has not been worn within the preceding 48 hours by someone who is actively infested with live head lice. Data show that head lice can survive under water for several hours but are unlikely to be spread by the water in a swimming pool. Head lice have been seen to hold tightly to human hair and not let go when submerged under water. Chlorine levels found in pool water do not kill head lice. Head lice may be spread by sharing towels or other items that have been in contact with an infested person's hair, although such spread is uncommon. Children should be taught not to share towels, hair brushes, and similar items either at poolside or in the changing room. Swimming or washing the hair within 1-2 days after treatment with some head lice medicines might make some treatments less effective. Seek the advice of your health care provider or health department if you have questions.